As a Stampin'Up! demonstrator I belong to a great team. We have team bloghops which IT wise is too advanced for me but at the moment we have a weekly colour challenge. I have really enjoyed this as it often uses colour combinations I wouldn't think of. This week it is Black, Sahara sand, pool party and crisp cantaloupe. Once I put the card out I knew what I wanted to do. I have used the pool party and crisp cantaloupe ink pads on a clear block then misted the block with water then stamped on the card with the block. I dried the paper with the heat gun then stamped the birds. I used the sahara sand to stamp the wheat along the edge. The printed image is distressed along the edges then mounted onto 3 equal widths of pool party, crisp cantaloupe and sahara sand card. The the whole piece is mounted onto black. The ribbon is pool party seam binding. All the inks, card and stamp set are available from Stampin'Up! Get in contact with me to order yours. I've had a great afternoon with friends trying lots of ideas with the envelope board. We started with a standard size envelope then worked our way down to a 2" square....... that one took some working out. We also made a few boxes. A small one that would fit 4 chocolates or 1/2 dz fruit tea bags in and a larger one that would take an assortment of gifts. 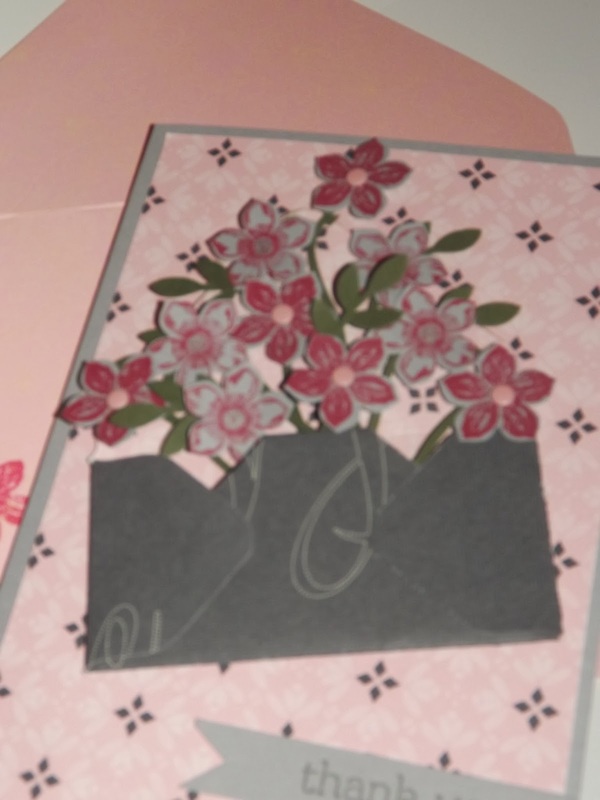 I then went on to make a card with an envelope on the front, and I made the large envelope for it to go in. None of the papers used are current stock as we were experimenting, but the flower stamp is the petite petals from the new spring/summer catalogue, stamped on smokey grey. Get in touch to get your copy of the new catalogue. The pictures are not very good quality and those with the flash don't have that brightness of colour. Hopefully they will improve with more practice. Well I thought I had 2 scheduled posts for this week but they haven't happened. As many know, me and IT do not mix well to say the least! So here is another one, its small and sweet. The first of this years valentine makes. This stamp would be lovely for an anniversary card too. The thinlet dies of the words have so much impact. I can think of lots of other words I would like. Well back after a lovely week of sea and sand. The posts are now going to come at least 3 times a week if not daily. A colleague set a challenge of using a 4 colour combination. The colours are: - soft sky, soft suade, crumb cake and a splash of crushed curry. This is the card I made. Just loving the coffee cup stamp set. I have coated the star in crystal glaze but mine is nearly at the bottom of the bottle and it is going all claggy. So thats on my next order. Would you like to run your own business, work the hours you choose, buy quality crafting products and be part of a supportive and friendly team, contact me today to find out more. 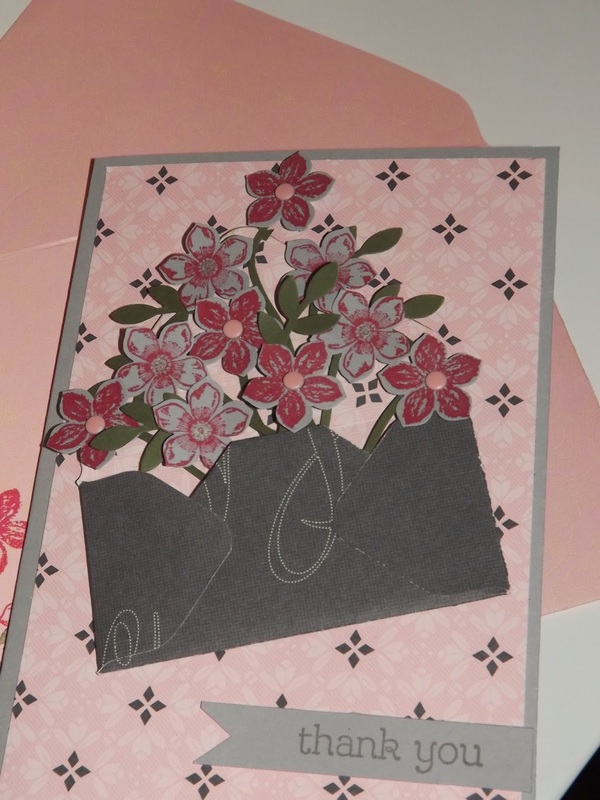 This is one of the cards we will be making on January 31st in the easy stamping class. Using all the 'in colours' its fresh and spring like. Besides who doesn't smile when they first taste that coffee in the morning? This stamp set is beautiful. I have only just bought it and haven't used all of the stamps yet so you will see a lot more of it. Rich Rassleberry is my favourite colour, its so lush. 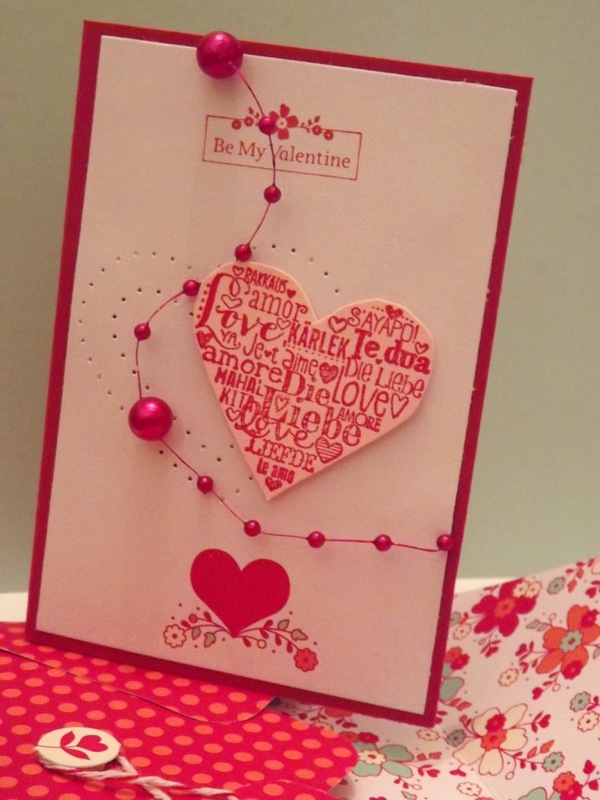 The use of second stamping helps give depth and variety of colour. I have used a dry water brush to paint gold ink on the centre of the flowers. Do you start the day with one of these on the way to work? How many people do you know who do? 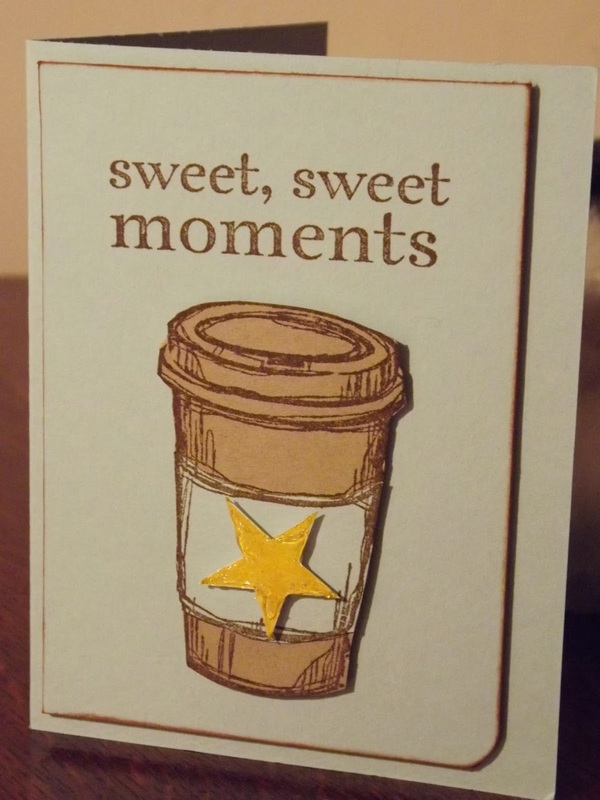 This is a small stamp set with 2 sentiments but the stamp of the cup is quite versatile. I have cut the lid off to prop it on the edge of the cup. I have used glimmer paper for the coffee. The glimmer paper idea I found on pintrest at polkadotsandpaper. This is a simple card but the detail on the cup is a little fiddly. Can you smell the coffee? Well that time of the Stampin'Up! year is upon us. SALE A BRATION. Some lovely items for free. This card uses 3 of the Sale-A-Bration items, Stamp set 'Banner Blast and the corresponding Punch, and one of the stamps from the Petal Parade set. I have used tangerine tango and Tempting Turquoise from the Brights. In the centre of the flowers I have used the brights dots and bakers twine to hang the banners on. The sentiment is form Yippee Skippee, you are going to see a lot more of this. Its fresh and vibrant unlike the weather outside! Hope you like it. My craft room was completed about a month ago. I do need a new table and some chairs but the garden chairs are good for the moment. I love the space and am getting better at putting things away as I've used them. How long I can keep that up for is another matter! New years resolutions, not many...... mainly to blog at least three times a week. Please feel free to nag if I don't. 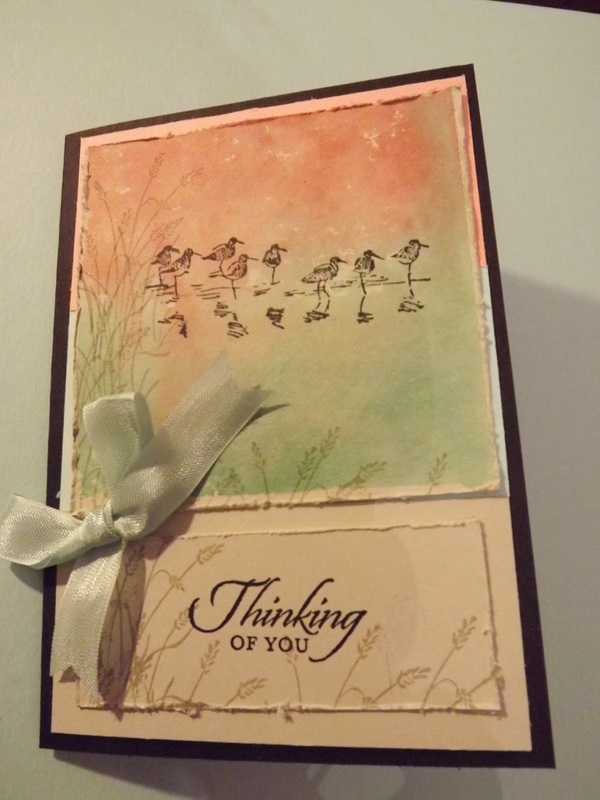 So Happy New Year and please keep visiting to see whats new in the Stampin' Up! world.